Buildings and cities today are increasingly interconnected with sensors providing real-time information for security, facility, environmental and enterprise management applications. The exponential rise in the number of installed sensors brings out the challenge of real-time situation awareness to city and building managers i.e. the challenge of swiftly and correctly interpreting the real-time data avalanche, making decisions and responding to real-time situations. NUCLEUS enables smart fusions that integrate real-time data, analytics, videos, locations and events with 3D environments to provide unified 3D situation visualization and management for different functions and facilities of the smart building/city. 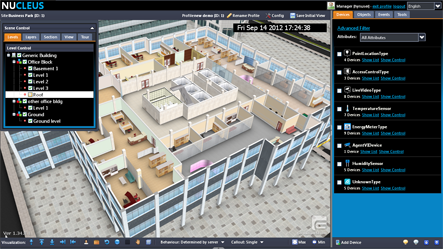 NUCLEUS is thus ideal for deployment in operations centres and command centres for use in the main large-screen displaying the Overall Real-time 3D Situation View, as well as in operator PCs for 3D premise management functions. NUCLEUS is a fully extensible and scalable platform with Application Programming Interfaces (API) for sensors, and a customizable architecture for supporting your additional needs in back-end premise management. Using optimized 3D building load caching with progressive texture loading, NUCLEUS is able to render 3D structural and textured premise models with interactive performance. Be it 3D indoor/outdoor/structural building rendering, the user is able to directly pan, rotate, zoom in/out and manipulate the 3D premise models. 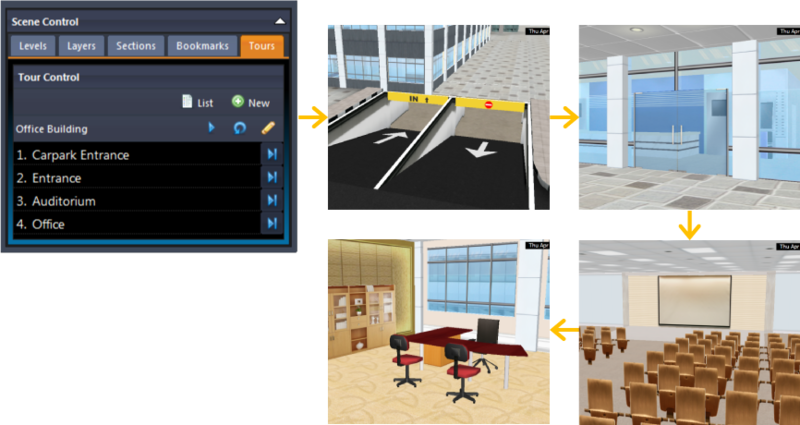 With NUCLEUS, users can also walk through the virtual premise in first-person navigation mode and toggle different environmental settings to visualize their 3D premises. 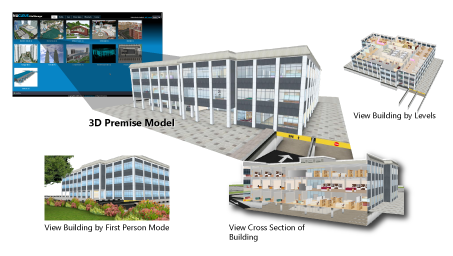 NUCLEUS’s hierarchical structuring of 3D premises into buildings, blocks and levels enables the user to have an in-depth control over the 3D premises visualizations. Apart from basic show/hide of the individual buildings, blocks and levels, users can also slice the building block cross-sectionally in order to view the building and related situations from a cross section. To complement NUCLEUS’ clear visualization of the 3D premises, NUCLEUS provides many methods of moving around the 3D premises, so wherever there is a point of interest or whenever there is an event of interest, the User can choose the navigation method that best suits the situation. In the interactive orbit-mode, the User can freely pan, rotate, and zoom into the 3D premises from a 3rd-person viewpoint, manipulating the 3D premises as if it were a miniature being held in hand. Apart from being able to view 3D premises, NUCLEUS helps to fuse the multitude of data captured from various third-party IP-based systems (e.g. 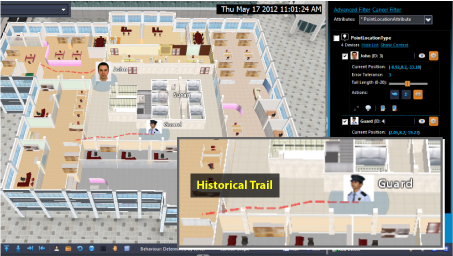 VMS, BMS, ISMS, RTLS) with the 3D premise model. 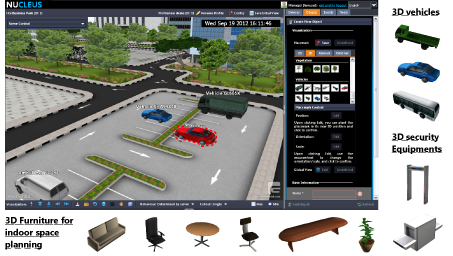 Coupled with data, event and 3D premise model, user is able to fully visualize the situation happening right in the premise. As a unified management system, NUCLEUS can be integrated with a variety of external real-time systems to provide a single, unified command view of the 3D premises and the sensors and controls it contains. 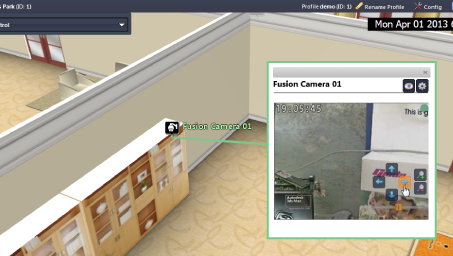 The User can effortlessly see the actual 3D location of any device integrated with NUCLEUS (e.g. which room a sensor is installed in), without the need for specialized training to read floor-plans and other traditional materials. For devices which track moving objects, e.g. RFID trackers, the User can see the object’s motion trail, in order to understand where the object has been and to have a hint at where it’s headed. 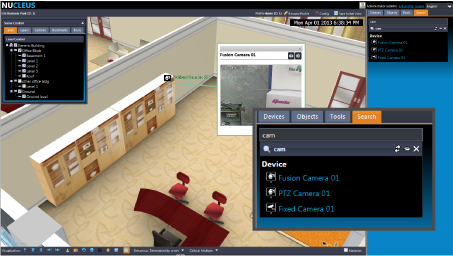 NUCLEUS enables users to ‘bookmark’ important locations that they have visited in the 3D premise model. Each NUCLEUS 3D bookmark stores specific virtual 3D camera and scene parameters, such that when a bookmark is selected, the 3D scene automatically glides to the previously recorded camera and scene parameters. 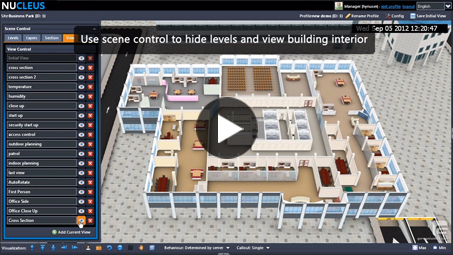 NUCLEUS provides tools and utilities to query specific information about the 3D premises. Just by using the interactive measurement tool, the User can easily click on any 2 points in the 3D view to measure the distance between them. NUCLEUS enables users to define, create and manage sensor devices that are physically deployed for their premises. 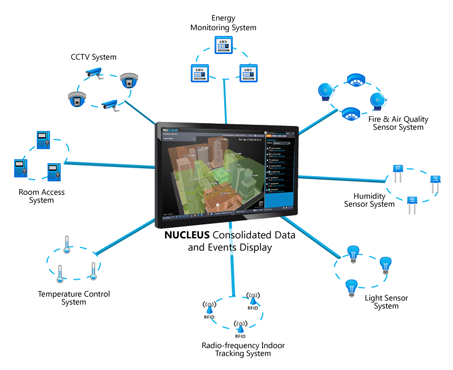 NUCLEUS also provides the Sensor API that enables system integrators to integrate real-time data from different third-party IP-based sensor sub-systems to NUCLEUS. 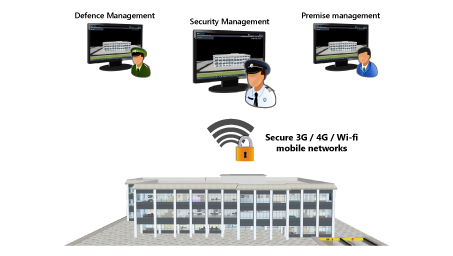 Such sensor sub-systems can include Video Management System with live CCTV systems, Integrated Security Management System with access control systems and fence intrusion systems, Real-time Locating System with indoor/outdoor positioning sub-systems as well as Integrated Building Management System encompassing environmental sensors, such as temperature sensors, humidity sensors and energy meters. NUCLEUS relays events and alarms from sensor sub-systems to the end-user via its event panel. 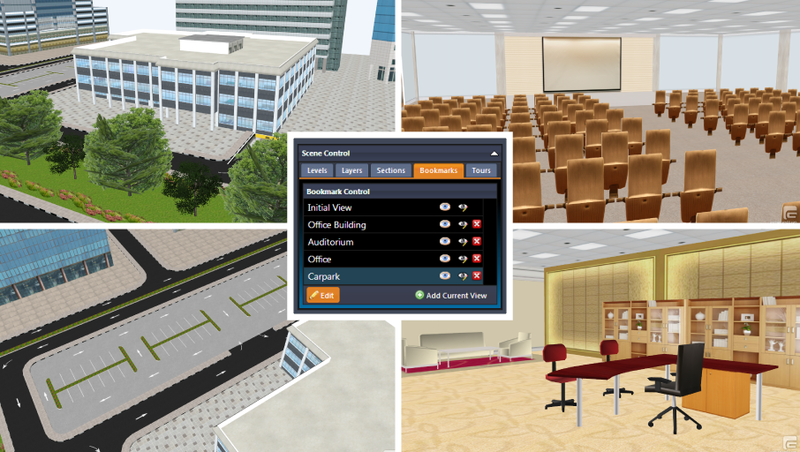 The Sensor API also enables system integrators to customize different event and alarm behaviors, such as automatically gliding to event location or highlighting the affected region, in the 3D scene as well as the system user interface. To minimize information overload, the User can have focused view of a device’s real-time information and controls by clicking its icon. The information and controls are then shown in a floating callout beside the icon. For example, when clicking a PTZ camera device, the callout displays both the video feed from the camera as well as its PTZ controls. The User can also choose to have a more comprehensive view of all the device’s details including non-real-time information by expanding its entry in the side panel, also conveniently accessible via a shortcut button on the floating callout. On large sites, there can be hundreds of devices and user objects. NUCLEUS provides a search function where user can simply type in part of the item’s name and NUCLEUS will quickly filter through the list of BBL, user objects and devices to aid user in finding items. NUCLEUS provides an easy-to-use and familiar web user interface style. The NUCLEUS frontend layout is easy to adjust, enabling the user to maximize or adjust the size of the 3D premise visualization window for different presentation purposes. NUCLEUS provides the site management tools for the administrator to upload, create and manage different 3D premise sites. For each premise site, the administrator can further create group of devices, known as profiles, which only specific groups of users can access. NUCLEUS requires authenticated login for access, and enables the administrator to set up and manage user accounts. NUCLEUS also enables the administrator to manage user access rights to sites and profiles, as well as to manage action rights of different user roles. NUCLEUS provides the placemark library management tools for the administrator to upload, create, group and manage 3D objects as well as 2D icons which can be used to represent the sensor devices and planning objects. NUCLEUS provides the custom device definition user interface for the administrator to define custom types of devices as well as the display behavior for the custom devices. 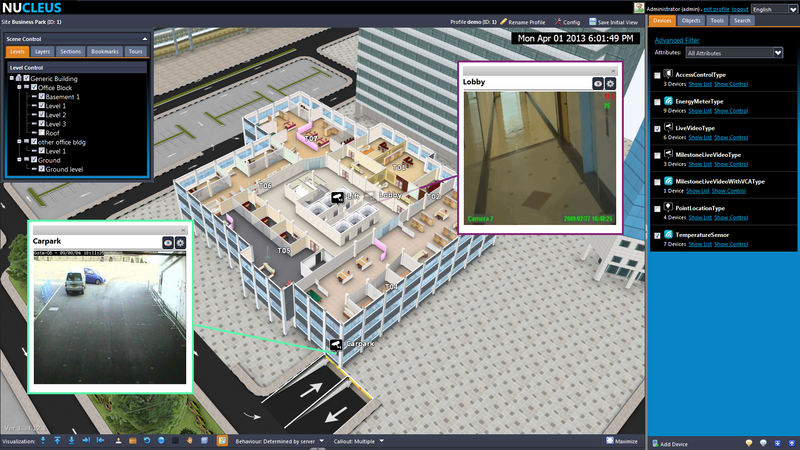 In addition to visualize live CCTV video via a window callout overlaid onto the 3D scene, NUCLEUS also provides advanced 3D video fusion features to project the live CCTV video directly onto the 3D premise model. As part of contingency planning and emergency preparedness, NUCLEUS also provides tools to enable users to plant 2D icons or 3D models onto the 3D premise model to mark and optionally annotate locations of interest, or to represent physical assets during deployment planning. Upon planning, the users will be able to know planning quantities or resource manifest to prepare. NUCLEUS provides the briefing director or commander with a direct 3D multi-touch user interface to quickly navigate and manipulate the 3D premise model to the target area of interest. 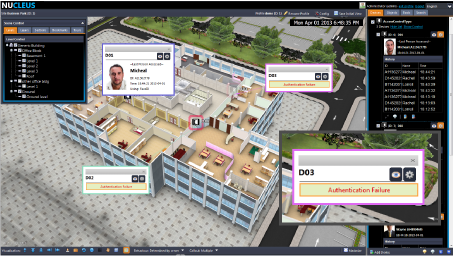 On top of viewing bookmarked views of individual places of interest, users can also play a series of 3D bookmarks to form an automated site tour around the entire 3D premises for prospective visitors. In addition, CCTVs can be configured to display video feeds at each stop of the tour, giving security management operators access to a simple guard tour. In traditional 2D map-based solutions, situational information is forced to be spread across several map pieces, as each 2D map can only represent a specific floor or section. 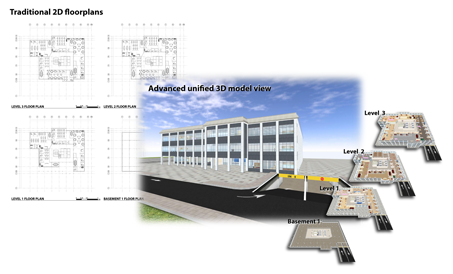 Instead of requiring the manager to monitor situational development over numerous 2D floor maps, NUCLEUS presents one single, unified 3D view of the situation using the 3D model of the premises. This enables the premise manager to effectively correlate incidents across different floors and sections, and avoids unnecessary blind-spots in judging situational incidents for further action. Instead of grappling with detailed architectural floor-plans that are difficult to interpret quickly, NUCLEUS enables managers to retrieve their 3D premise models quickly and provide powerful building visualization tools for managers to study their 3D premise models easily for emergency response purposes. 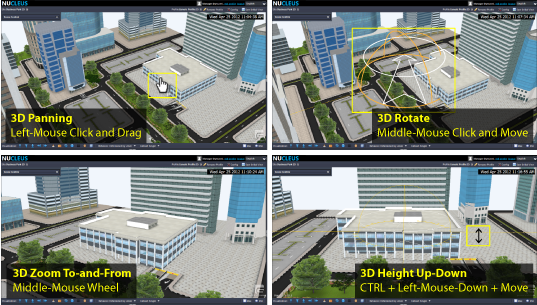 Managers can easily view different 3D building floors, visualize the building cross-sections and explore the 3D premises virtually. With NUCLEUS, 3D premise models can be accessed by authenticated users via network. This enables mobile, field command units to access 3D premise models securely via 3G /4G/wi-fi mobile networks during event operations. 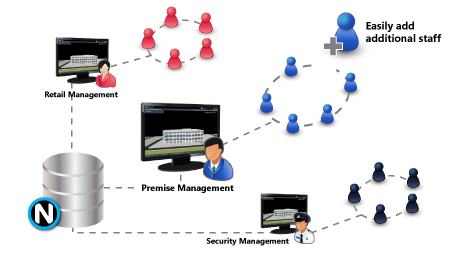 In addition, premise managers can use the 3D premise sites for discussion, work-planning, and training and familiarization of staff in the management of multiple remote premise sites. 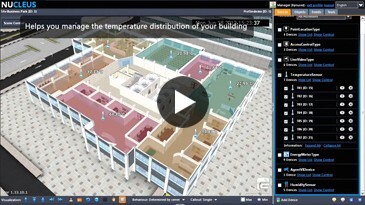 NUCLEUS provides a visually clear and powerful way for premise managers to brief and co-ordinate tasks and watch-points for his or her teams, using the 3D premise model as the briefing context. 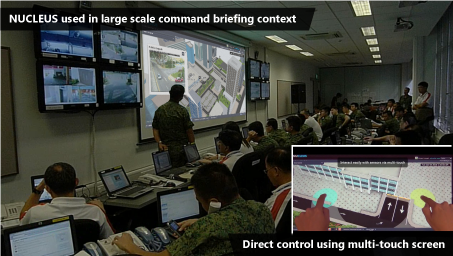 When deployed on a large multi-touch screen, the manager can also directly control the 3D premise model via simple multi-touch actions to engage the operational team efficiently. NUCLEUS provides 3D asset planning tools for premise managers to develop asset plans by planting 3D asset models directly onto the 3D premise model. This enables managers to create different types of plans, such as event and deployment plans, for training, briefing and contingency purposes. NUCLEUS provides the scalability to add additional staff members to the premise management team. Based on a networked, web-based architecture, it is technically fast and easy to set up access and usage for an additional user. There are also no application restrictions on additional users and connected client-machines. Thus, NUCLEUS is ideal for major events where the operations team can scale easily from a small group initially to 50-100s users eventually. 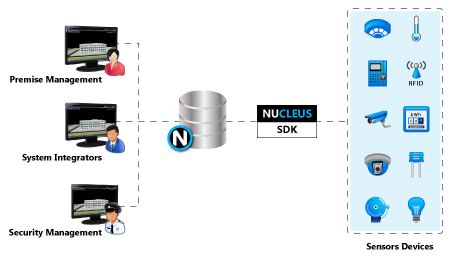 NUCLEUS provides the extensibility, via the NUCLEUS SDK, to integrate with custom sensor devices and other live data sources. This enables end-users and system integrators to systematically plan extension roadmaps to integrate with other sensor sub-systems in the future. Using NUCLEUS’s open integration platform, premise owners get to mix and match the “best-of-breed” systems for an optimal system design, and system integrators are able to deliver the target system design at lower costs in comparison to R&D costs in direct integration.